It’s only natural that a successful formula gets copied. It’s not a phenomena limited to games, after all, and when something is as huge as GTA, it’s inevitable that there will be a great many imitators. Realtime Worlds, vindicated of thievery somewhat by the fact that its founder created the GTA series, need to be commended both for doing something new with the free-roaming crime-centric city-based game (FRCCCBG!?) and for doing it so completely brilliantly. 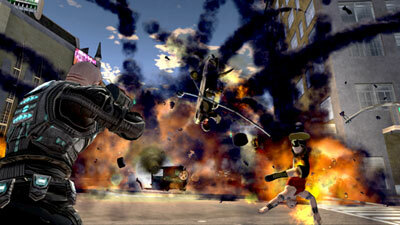 Crackdown casts you as a super-powerful agent for ‘The Agency’, tasked with eliminating three gangs in Pacific City, a city completely overrun by crime. Throughout the course of your mission, you’ll find your lost love and follow your agent as he finds meaning in a life dedicated to an endless and ultimately futile quest to rid the world of crime. Ha! Fooled you! You actually go around and blow lots of stuff up, occasionally killing one of the generals on your way to each gang’s kingpin. What plot the game has is window dressing at the absolute most, and is really there more to tick a box than to perform any function within the game. Even the kingpins are largely irrelevant, to be fair. They’re not bosses, in the sense that they’re not really any more of a challenge than the bog standard enemies, and just provide a few extra achievement points and a measure of how much of the map has been uncovered. Most of the fun to be found in this game is from running around by yourself, messing about either on your own with the Havok physics and near perfect platforming for company, or in co-op with a friend. That’s high praise for the platforming in particular, especially when so many otherwise great 3D games drop the ball in that respect. I can’t remember the last time I felt so in tune with the abilities of my character, to the point where questions of whether or not I could make a jump became completely instinctive. It’s remarkable that I can make a jump and swing the camera around to make a perfect landing on a roof a couple of metres across in a free roaming game like this when even a great deal of 3D platformers can’t do it this well. The main complaint is one of longevity, as it’s true that you can run through the game’s bosses in as little as six hours, ostensibly finishing the game. To mark it down on this basis is missing the point, though. Besides the various modes to encourage repeat playthroughs, there’s orb hunting, rooftop races, street races, time trials, and one of the best implementations of achievements that I’ve seen. 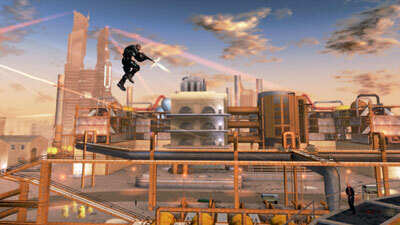 The system has its detractors, but Crackdown rewards exploration and testing the limits of the game, for example by giving you ten points for climbing the Agency Tower (a rewarding experience on its own) and then another ten for jumping off into the small pool of water below. If you can think of a way to challenge yourself, chances are there’s an achievement for it. Recent downloadable content has added even more, with a racing mode and extra items playing second fiddle to the astute addition of a cheat mode. While this allows you to take what is usually a rock solid engine beyond its limits, it’s a worthwhile trade when you can make the top of a skyscraper look like a nuclear explosion when detonating hundreds of spawned barrels. Realtime Worlds know that their game’s greatest asset is its capacity for play, and this mode allows the player to realise it. There will be bigger, longer, and more technically accomplished games this generation, without a doubt, and it’s disappointing that this will dissuade people from looking at this game as more than a way to play Halo 3 a couple of months early. This game is focused in its intention to be unfocused, to let the player run free and to make the game more than it perhaps appears. It’s absolutely a firm favourite of mine and one of my early candidates for game of the year so far, and for those reasons I have no hesitation in giving it full marks.